In Thailand, the asterism of the Great Bear constellation—or Ursa Major—is well known as the Crocodile stars. A popular nursery rhyme describes its movement in the night sky. 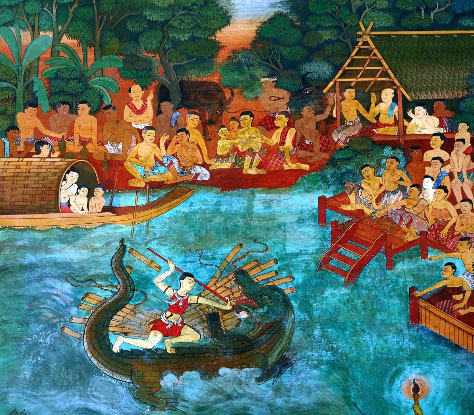 Hence the proposal by the Thai Astronomical Society to name the 47 Ursae Majoris system as characters from a Thai folk tale centred around a great crocodile. Lord Chalawan was a large, powerful and aggressive crocodile who lived with his cohort in an underwater cave in the town of Phichit. The cave had an enchanted crystal with a power to turn any crocodile in the cave into human. One day while Lord Chalawan went out to feed, he spied the sisters Taphao Thong and Taphao Kaew, daughters of the rich man of Phichit, bathing in the river. Enamored with Taphao Thong, Lord Chalawan seized her in his mouth and carried her back to his lair. The rich man learned that a crocodile took his daughter away and paid many crocodile hunters to capture and kill the culprit crocodile. But Lord Chalawan was invincible due to the magic of his crystal tooth. No crocodile hunter came back alive. The ultimate crocodile hunter to take the challenge was Krai Thong, a young merchant adventurer well versed in magic and possessor of Sattaloha spear, the only weapon that could hurt Lord Chalawan. Krai Thong used magic to summon Lord Chalawan up for a fight. The losing Lord Chalawan fled to his lair with Krai Thong in close pursuit. In the underwater cave Krai Thong overpowered the human Lord Chalawan and freed Taphao Thong. With Lord Chalawan in harness, Krai Thong took Taphao Thong back to her father. Lord Chalawan was slain by Sattaloha. As promised, the rich man gave Taphao Kaew along with half of this wealth to Krai Thong. As for Taphao Thong, the rich man also married her to Krai Thong since the crocodile hunter was her rescuer. As a tonal language, tones should be taken in to account while reading Thai names. Otherwise misleading may happen.Luckily, these three names comprise mostly middle tones, which are easy to read for non-Thais. Only the 'Kaew' is different. This syllable starts with high pitch and falls rapidly to low pitch.